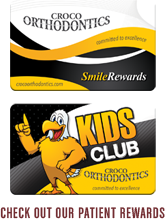 At Croco Orthodontics, we provide effective, efficient orthodontic treatments in a fun and inviting atmosphere. As a family-oriented practice, Dr. Matthew Croco and our staff strive to involve patients and their families in all aspects of the treatment we provide from their first visit. We want to know your goals in seeking orthodontic treatment, and your activities and lifestyle. That way we can create an individualized plan that works for you and your needs. We offer a variety of treatment options that can be customized to meet your needs and will discuss them with you. Dr. Croco and our team will answer your questions and concerns so you can decide which options are right for you. When you are looking for an orthodontic practice for yourself or your child, we invite you to contact us to schedule a complimentary consultation. This will allow us to get to know you and for you to learn about our practice, our services, and how we can create a healthy smile for you. We offer early morning, as well as before and after school appointments at our Coralville and Mt. Pleasant, IA offices. Everyone at Croco Orthodontics looks forward to welcoming you to our family and working with you to create a stunning smile that will transform your life.